Weight capacity of the bench – this needs to be high enough to take your bodyweight plus any weight you will be lifting. Where the feet of the unit sit – I find wide feet at the base interfere with my leg stance. Critically, the feet under the headpiece need to be positioned so as to not interfere with the power rack itself. As you are looking for the best solution for use with your squat rack, consider the number of incline/decline positions it can be set to. I want a sturdy adjustable solution. Do you? 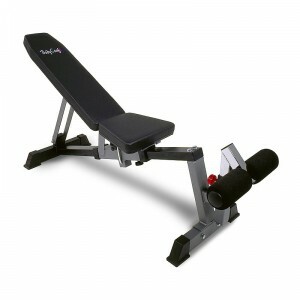 I previously owned a cheap one which I used for heavy benchpress and found it wobbled so much I threw it out. Make sure to read online reviews to get one which is going to stay firm. Think about the consequences if not, would you want to fall off with 80kg+ in your hands?! Warranted for home and commercial use – nothing says good quality like being approved for commercial use. Enough said! Critically, as you incline the F320, the seat slides backwards meaning your head is always in the same place in relation to the rear feet. This means when doing military/incline presses you are positioned under the J hooks without the feet interfering with the rear of the cage. Great feature and the only one on the market to offer this! It is c.18″ tall which makes it the perfect height for those of us who are shorter. I can get great foot drive with this bench despite being 5’7″. A big plus over the Ironmaster (the next best) in my view. It’s got a couple of wheels to make moving it around easier. I actually store it on it’s end as well so it takes up a little less room. Also, I put my money where my mouth is and actually own one of these benches. I’m very impressed and use it 4 times a week without fail and it is still solid. Is the F320 the best weight bench for home use? In my view it offers a great feature in the unique sliding mechanism making it one of the greatest available. As such I would be inclined to say it’s the best bench available pound for pound at the moment. If you do not use a cage you may like to try a difference one, however (which we will look at separately).